We are generally carnivores in the Smockity family, but this is a hearty vegetarian dish my family of 10 loves. It is comforting and filling with just the right touch of spicy for a cool fall evening. Sometimes we throw caution to the wind and add a pound of browned ground beef (as we did in the photo), but it is totally optional, because it is perfectly delicious without the meat. 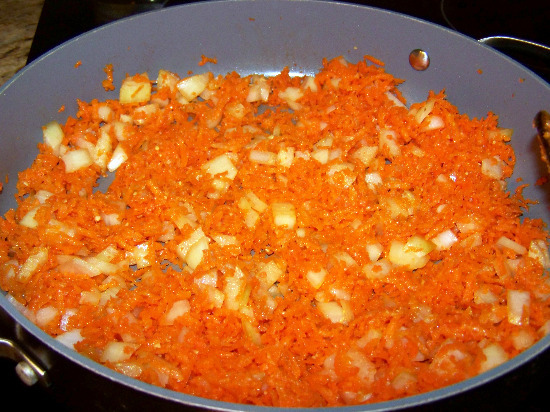 Heat oil, garlic, onions, and carrots until soft. Add tomatoes, beans, tomato sauce, and corn. Mix well and stir in spices. Cover and simmer over medium heat until thoroughly heated, stirring occasionally. Place chili in deep casserole dish (or leave it in the dish used for simmering if it is oven proof). Spread cornbread batter over top. Bake at 375 for 30-45 minutes. Connie is a homeschooling mama to 8 rowdy children, wife for 25 years to one hunky golf pro, writer of stories, wiper of noses. She strives to live a joy filled life in the noisiest house on the block and blogs regularly about life in a large family at Smockity Frocks. She can also be found on Twitter and on Facebook. Not being much of a cook (but I’m trying! ), I’m unclear on what you mean by “favorite cornbread recipe, topping” and 4. Mix cornbread batter. Do you mean you use something like the Jif instant cornbread mix and make it up according to the instructions, then spread it over the chili mixture? 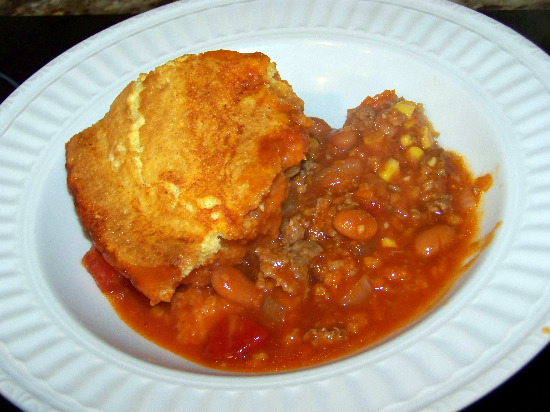 Yes, you can follow the Jif cornbread mix directions and pour the batter over the chili, or you can make cornbread from scratch and use that batter. Love this recipe! Looks like a great one for leftovers – leftovers are my best friend these days. I just did a Lasagna the same way, all vegetables – but you could easily add ground turkey or beef to the sauce. I just love all-veggie cooking these days. But I wouldn’t consider myself a “real” vegetarian. It’s just so healthy & inexpensive to cut out most of the meat from your diet! We have been craving chili , but have not made it yet this fall. Now I know why… we were waiting for this recipe! I cook dinner for my oldest son and his family on Thursday evenings. Can you guess what we are having? Yep, vegetarian chili pie!!!! Mmmm, my husband is a strict meat eater, but I try to keep a few meatless recepies on hand to stretch the budget, or fill in when I feel a lack of plant life exists in our diet, which is often. Hes pretty picky about what meatless meals he will tolerate, he won’t just sit down to a salad, it has to be a hot meal that suits being meatless, but I think this one would make the cut, I’m going to try it out next week. Though, I’m thinking of using a mashed potato top like a shepherds pie… might suit us better. Just a quick question though, I live in Australia so we tend to have differences in ingredients, the most popular bean to use for mexican dishes here is the kidney bean, in fact its rather hard to find anything else without going to the health food isle and buying dried beans, which I am begining to do. Anyway, obviously this recepie will work for whatever you have lying around, so kidney beans will be fine, but what is the difference between kidney and pinto, is there any real difference? I also see a lot of american recepies call for black beans, which I also just substitute for kidney as I have never actually tried a black bean before. If there much differencce among the three in flavour and/or texture? To buy them I will have to buy them in bulk dried, so I am a little hesitant. Oh, yum! I’ve bookmarked this one to try sometime soon. Looks like a great recipe for the cool fall weather. Abba12, Kidney beans are darker, larger and a bit firmer than pinto beans, but taste similar to me. Black beans are small, with a distinctive taste, which I like, but can’t think how to describe. Maybe stronger than kidney beans? I think any of those would work in this dish. Tried this for supper tonight. My husband loved it! I made this for dinner the other day – seriously yummy, and it did two meals for us (even though I halved the recipe – there’s only me and my husband) so that saved work. My husband was a bit apprehensive at the thought of Chili Pie, and later explained that he’d been expected a pastry case filled with fried whole chili peppers!!! I think he liked this version better. What can I use in place of tomatoes and tomatoe sauce? 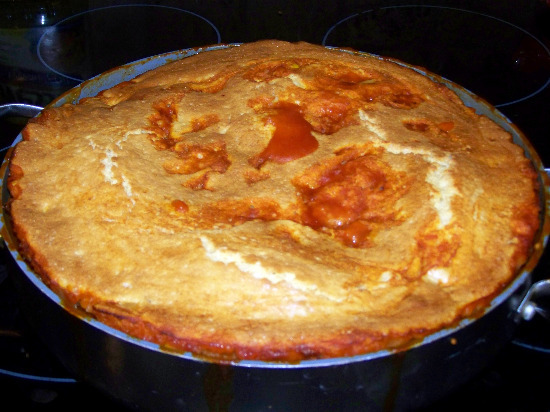 I couldn’t find a corn bread mix/recipe that didn’t have gluten or egg (I am G.F. and my son is allergic to egg) so I made this with biscuits since they don’t have egg and just scoped mine out before adding the biscuit topping. The flavor is very good and I will definitely make this again!